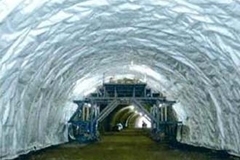 Vynon EF sheet is a Tunnel waterproofing geomembrane especially developed for NATM tunnel application. * Average of 5 points should be Min. 0.8mm and minimum thickness should not be less than -5% of the standard.